Ouch! Hope you heal fast! I keep a tube of Calendula cream (can you buy Nelsons Burns Cream?) in the kitchen for kitchen accidents – it is amazing, just rub in straight away! Your caramel looks lovely! I’ve made it with yogurt before but this looks a wonderful dairy free alternative, YUM! Thanks! Today is a better day… 🙂 I had the Nelson’s Burn Cream recommended – going to check it out today. Have a great day! Great story! other than the burn of course. The things we do for good food… 🙂 It looks really delicious. I’m going to have to try all these recipes this summer. Teach the kids to cook. Body Parts??? So sorry you burned yourself! But wow, what an amazingly easy recipe. Thank you for sharing! This stuff is amazing! Salt and caramel. What an incredible combination. Can’t believe I never tried this before. Gotta pace myself here. LOL 😉 I can see this becoming a frequent treat in our household. This tastes very strong of honey. The texture is like caramel but the taste isn’t really. I tried adding vanilla to it to tone it down but it’s still very strong. We poured it over popcorn and it’s okay, not great but edible. Sorry – we’re on the GAPS Diet and honey is the only sweetener we can have…we must just be used to it. I would guess you could try it with sugar but I haven’t. 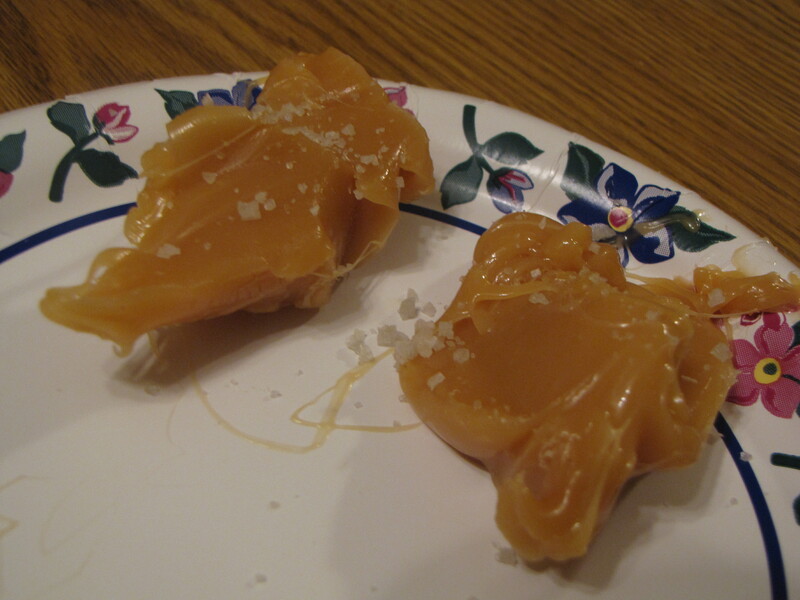 I’ve had honey caramels before and this recipe is like a honey caramel on crack, super strong flavor. I was sad the honey totally overpowered the coconut. We poured it over popcorn and it was passable, the kids are slowly munching it, but it mostly just tastes like honey popcorn to us. Sorry about the burn but thanks for your honesty and sharing to prevent others from doing the same! We’ve been using raw honey for our burns. I absentmindedly grabbed my hand around my stovetop coffeemaker filled with boiling water. Immediately I coated my hand with honey. The pain went away and not even a blister formed. As if nothing happened. My daughter got nearly 2nd degree burns on her back once. I coated it with honey and had her wear an old tshirt. Overnight, the redness went away. Her skin healed without even peeling. I’m making your caramel recipe right now. My Christmas present to my daughter- her favorite food. Thanks! I can’t remember if I commented on this in my post, but that is how I healed that burn up too. No scar. Glad your family enjoys the caramel 🙂 Happy New Year!